A Romance Readers Dream...6 books for 0.99!! SWEET & SENSUAL contains 6 complete romance novels by award-winning and international bestselling authors: Cheryl Kaye Tardif, Chris Redding, Kat Flannery, Melodie Campbell, Alison Bruce and Catherine Astolfo. LANCELOT’S LADY by Cherish D'Angelo/Cheryl Kaye Tardif – A Bahamas holiday from dying billionaire JT Lance, a man with a dark secret, leads palliative nurse Rhianna McLeod to Jonathan, a man with his own troubled past, and Rhianna finds herself drawn to the handsome recluse, while unbeknownst to her, someone with a horrific plan is hunting her down. BLONDE DEMOLITION by Chris Redding – Mallory Sage lives in a small, idyllic town where no one, not even her fellow volunteer firefighters, knows about her past life as an agent for Homeland Security. But a twisted serial killer has found her, as well as her former partner and lover, Trey McCrane. Now Mallory and Trey are on the run, and time is running out. CHASING CLOVERS by Kat Flannery – Mail-order bride, Livy Green, is desperate to escape the memories of her past. John Taylor will never love another woman again, but his children need a mother. As Livy's past catches up with her and suspicious accidents begin to happen on the ranch, she is tempted to tell John the truth. But will he send her back if she does? ROWENA THROUGH THE WALL by Melodie Campbell – When Rowena falls through her classroom wall and lands in an alternate world, she doesn't count on being kidnapped―not once, but twice―and the stakes get higher as the men get hotter. Unwanted husbands keep piling up, but that doesn't stop her from falling for the wrong brother. Good thing she can go back through the wall. Or can she? UNDER A TEXAS STAR by Alison Bruce – When Marly Landers is fooled by con man Charlie Meese, she's determined to bring him to justice―even if it means dressing up as a boy and setting off across the plains to find him. Texas Ranger Jase Strachan is also after Meese. Under the Texas stars, Marly and Jase are drawn together, yet fate plots to tear them apart. SWEET KAROLINE by Catherine Astolfo – Anne Williams says she killed her best friend, Karoline. But did she? Or is there more to Karoline's mysterious death than meets the eye? Anne embarks on a compelling journey to discover her past and exposes an unusual history, horrific crimes and appalling betrayals. With a list price total of nearly $24.00 US and over 340 reviews on Amazon.com, SWEET & SENSUAL is a value-packed romance bundle of complete novels that takes you from romantic suspense to historical romance to fantasy romance all set in captivating worlds that will leave you wanting more. We have never met, and with the many years between us, you being born in 1775 and me in 1977, the likelihood of this occurring is slim. However, I have admired you since I was sixteen years old, when I read Pride and Prejudice for the first time. You were talented beyond your time, and as I researched your life more, I was saddened to learn that you never received acclaimed status or rave reviews for your work as an author while living. The early 1800s were not ready for women to be raising their fists while demanding recognition and a place in society, but you thought it so. You were eager and honest for women to be held in some form of esteem other than the mere whisper from behind their men. You lived during the French Revolution, the Napoleonic wars and the Industrial Revolution, and yet there is never any mention of them in your novels. These historic events seemed to have passed you by without notice. When I open your books, I’m transported back to a time where none of this existed. Instead, romance, common sense and reason are woven into your words. The history lover in me cannot help but be disappointed. In fact, if I had the chance to go back in time, it would be to the early 1800s. I’d want to live in England and experience life among the commoners. 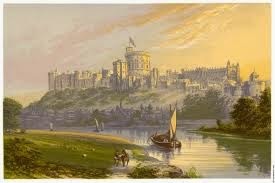 To witness King George III rule the country and catch a glimpse of WindsorCastle. I’d run through the countryside in awe at the land untouched by man. No high-rises. No computers. No cell phones. The only sound I’d hear would be the birds, the forest around me and the quiet hum from the village nearby. I’m sure as you’re reading this, high-rises, computers and cell phones are all alien to you, but they’re a part of my life as much as reading, gardening and household chores are yours. I’ve often wondered what life was like for you or those who lived back then. I smile at the conversations we would have talking about our differences. I’d hope, dear Jane, that we would be friends. I’d probably sit and stare at you in awe for the first little bit, which may frighten you, but rest assured it is merely my fascination of being able to talk with you that has me looking like a crazed lunatic. 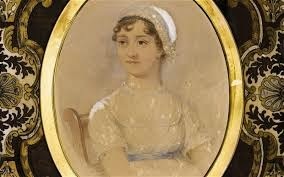 We would soon get past my strange attire of jeans and a t-shirt and your high-wasted regency gown and start chatting about literature, the weather and what our likes and dislikes were. We’d sip tea, sharing the leaves, and you may offer me some bread with cheese. 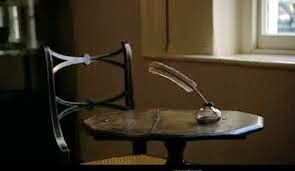 I’d beg for a tour of your home in Chawton, only to see and discreetly touch your furniture, clothing, quill and papers. This, too, may seem a bit odd, as I am a stranger in your land, gaping at your everyday possessions like a mad hatter. Jane Austen's home, Chawton Cottage. I’d show you a few things from my time as well. My laptop—much like your quill, ink and paper—is how I write my stories. I’d have it charged, of course, since electricity was not a commodity then. I snicker, wondering what your reaction might be to this new and foreign object. You may think it a wonderful novel idea while skimming your fingertips along the keys, or throw it to the ground scared to death. However, I hope it’s not the latter. You’d ask about the markings on my skin, and I’d explain that they are tattoos and a way of expressing myself, to which I’m sure you’ll disagree, but it won’t damper our conversation because you’ll want to know everything about me and my life. How do I know this? It is because you’re an author, Miss Jane, and we are very similar. My curiosity is much like yours for things I have not yet had the chance to live. I know you can relate to this because I have read all of your novels. You’d be overwhelmed with all the information I’d tell you, but your lips would stay firmly shut as you listened intently to what I was saying. I’d hope we could write something together, such as a poem or short story. Our ideas would be quite different living worlds a part, but we are both creative and so I am not concerned. Miss Jane, I’d love to hear what your voice sounded like, the pitch of your laughter and the quiver when you’re angry. I’d hug you tight and offer my friendship to you forever, but most importantly I’d thank you for giving me stories which inspire me to write as well as you did. Thank you for keeping me company on the lonely nights where I was without friends and had no one to talk to. Thank you for showing me how to write characters with emotion and plight, and for taking me away to a period I knew nothing about. You have been my influence for writing. You wrote and published in a time where women authors were unheard of, and I admire you for the hardships you endured to get there. Bless you, dear Jane, you have given the world a gift, and I thank you from the bottom of my heart. novels for one low price of $1.99!!! It cannot get any better than this! With an individual list price total of more than $45.00 and over 640+ reviews collectively on Amazon.com, the DEADLY DOZEN Book Bundle is a value-packed, rollercoaster thrill ride that takes you from amateur sleuth to detective to paranormal to ancient mysteries set in intriguing worlds and so much more. Imajin Books 25 Days of Christmas Event! It's that time of year again where my awesome Publisher, Imajin Books hosts their annual 25 Day's of Christmas Event! This Christmas, great things come in fours! Join Imajin Books and our authors for our annual event, which includes a Kindle Fire Giveaway (Dec 1-25), Paperback Sale (Dec 1-7) & an eBook Sale (Dec 24-Jan 7th). * Kindle Fire HD Giveaway - Dec 1-25 - Enter via our Facebook page. * Paperback Sale - Dec 1-7 - Check out our paperbacks HERE. * eBook Sale - Dec 24 - Jan 7 - Check out our ebooks HERE.